1. What is raw milk? Raw milk, which is also referred to as real milk generally comes from cows that are raised on pasture and when the cow is milked, the milk is not pasteurized/cooked . Be weary of farmers that sell raw milk from cows that are not 100% grass fed as the nutrition of the cow and the milk that cow produces, declines. To learn more about raw milk visit www.realmilk.com and to learn about why 100% grassfed is best, go to www.eatwild.com. 2. How long is raw milk good for? Our milk is generally good for at least 10 days if kept cold. However, if it gets warm it will sour. Sour milk is actually good for you but the taste buds do not like it because we are no longer accustomed to drinking it sour since the invention of refrigeration. We sell milk that is 5 days or less old from the date it was bottled. Some customers enjoy drinking the milk for up to 20 days. If the milk is past the 5 day bottle date, it does not mean there is anything wrong with it. On the contrary, it actually continues to grow healthy bacteria. If your milk does not last at least 5 days from when you purchased it, please let us know. 3. Can I get my dairy products bottled in glass instead of plastic? We do have an option to accept glass bottles from customers to use instead of bottling the milk in plastic. However, this is something that needs to be discussed on a case by case basis. Please email us at fullcirclerealfoods@gmail.com to discuss this further if you are interested. 4. What if I am lactose intolerant? We have had many customers state that they are lactose intolerant and then drink our milk and have no problems. It all depends on the person. We would recommend that you try it in a small dose and see how it works out for you. Generally, when milk is not pasteurized it allows for more healthy bacteria to be present in the body which interacts with the lactose in the milk in a way that it can be more easily broken down which causes less unwanted side effects for those with lactose sensitivities. 5. What is better about grass fed cows vs. grain fed/finished cows? Many times farmers say that they use grain to finish the cow so that the meat marbles more nicely. We do not agree with that at all. The main reason that grain is used during the life of the cow and/or at the end of their life prior to going to the butcher is simply to fatten them up more quickly. However, in doing this it hurts the cow and reduces the number of nutrients available in the meat. We do not want to just produce large volumes of milk and beef, we want to produce the most nutrient-dense food possible. Grass-fed meats contain more antioxidants, omega 3-s, CLA and trace minerals and vitamins than grain fed beef. For more info go to www.eatwild.com. 6. What does forest-fed pork mean? We start our pigs on the pasture for the first month of their life but then they spend the rest of their life in the woods in 1-5 acre paddocks. The pigs are moved to new paddocks every 3-7 days. This not only allows them the opportunity to forage for nutrient dense wild plants, roots, shrubs. etc. but it also ensures that the land is protected and not overgrazed. This greatly adds to the flavor and nutrition of the meat. Try our pork and see if you don't believe that it tastes better than any of the competition around. 7. What does free-range really mean for our farm and farm partners? Our chickens for example roam free and can leave if they wish, they are not in a pen or confined. They get fresh air and sunshine, what a concept! Confinement chickens are penned inside all day every day without these things. Come visit the farm and see if what we do suits you. It is a great idea to go see where your food comes from whether us or another farm. Most of what you buy even at the health food store you will not buy if you visit the farms! 8. What is Non-GMO Verified feed? Non-GMO verified feed has been evaluated and approved as part of the Non-GMO Project. 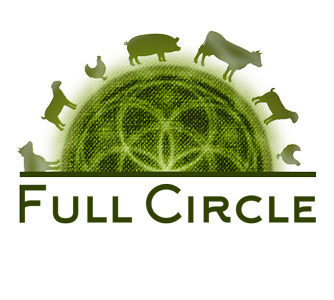 This feed is used 100% for our pigs, egg layers and for various batches of our chickens. To learn more about what this seal means visit: http://www.nongmoproject.org/learn-more/understanding-our-seal/. We believe that this seal is better than organic as it requires that less than 1% of GMO's are allowed in the feed. Comparing this to Organic feed, it has been field tested and shown to contain at least 13% GMO's as there are no regulations on the amount of GMO's that can be contained in the final product of Organic feeds. 9. What is the pet food law? There are a few states in the United States that have created the Commercial Feed Law which is also known as the Pet Food Law. Florida is one of these which allows small farmers to sell meat, dairy, etc. as "pet food not for human consumption." This puts the responsibility in the hands of the consumer to learn where their food comes from and how it is produced so it is important to develop a relationship with your local farmer and visit their farm and better understand their farming practices. It also allows small farmers to have less regulations on their farm which were generally made for large farms and are not always applicable to small farms such as the mandate to go to a USDA butcher versus being able to support a local custom butcher. So, if you see a “Not for Human Consumption” or “Pet Food” label on your product, no need to be alarmed it is just how we have to operate to be legal. 10. What is the cottage food law? The cottage food law is also a law within Florida which allows small farmers to produce breads, candies, condiments, dry goods, pastries, etc. from their home without the need to build a Commercial Kitchen. Sales must be below $15k per year to fall under this law. Same as the pet food law, this places the responsibility in the hands of the consumer to get to know their farmer/local producer and it allows a small farmer/producer to be able to bake/make these items in their home versus having to spend up to $100k to build a Commercial Kitchen.